After travelling for 20 hours from Canada to Moscow, I immediately took my first overnight train to Kursk. In hindsight, Kursk is not the best first impression of Russia. Everywhere I looked I saw dirt, hardly any plants or grass, and the buildings were old and worn. The closest convenience store was a 25-minute bus ride away. All I could think was that I was across the world in an environment totally opposite to what I was accustomed to — and no one would be able to find me if something happened. I was in the middle of nowhere, with no one to talk to because no one could speak English — not even the coaches. Imagine dinner time, listening to 11 girls laughing and conversing and I was just sitting at the table quiet, listening to them speak in what sounds like gibberish, but they call it Russian, while attempting to read the menu. The menu is also all in Russian, and even more difficult – it’s in the Cyrillic alphabet. I may be painting a horrible picture, but that was my first impression of Russia. For a while I thought it was going to be a very long, lonely year. Finally, I arrived in Novosibirsk, the city I was going to live in for the next eight months, and things got a lot better. Being in a big city and seeing familiar restaurants gave me hope. The girls started to get more comfortable with me and we even learned how to communicate with each other using minimal words and Google translate. We got so good with our irregular form of communication that I eventually was able to share laughs with them during dinner. When people ask if I enjoyed living in Siberia I always tell them that while the weather reached temperatures that made my face hurt, I liked it a lot and the name just has a bad reputation. I learned coming from Windsor, Ontario that it’s really the people that make the city. During my time in Russia I met a lot of great and helpful people who made me really feel at home. It was definitely an adjustment, going from a multicultural country and city to being the only non-Caucasian female in a city of 1.5 million people. At first, I was caught off guard because people would stare at me, but then I realized they had never experienced the privilege of living amongst different cultures, like I had. I understood it was not common for a person like me to walk the streets of Novosibirsk, so I had to learn to attribute these stares to people simply noticing difference, and not to take it personally. My favourite thing about living overseas is learning and adapting to an unfamiliar country. You learn so much about yourself when you are constantly stretched beyond your comfort level. The process is certainly uncomfortable at times, but the experience of moving toward better self-understanding and self-knowledge is so peaceful and meaningful. After living a different lifestyle with a new culture, government and people, it really opened my eyes and made me appreciate my home country of Canada where my love of basketball first emerged. I started to play basketball because I had to go to my brother’s practices and I preferred to run and play rather than to sit on a bench and watch. So, my mother put me on a team and I never stopped after that. To tell the truth, I never thought I would play basketball this long. I never thought I would be on the national team or play professionally. My mother always told me to keep playing if the doors continued to open and that’s exactly what I did. One opportunity came after the next and then this extreme sense of urgency kicked in. It was the realization that I really can do this, and I started to create basketball goals for myself. The more I trained to attain these goals the more I fell in love with the sport. I discovered it was the place where I can thrive, express myself and keep balance. It allowed me to push myself and see the efforts of my hard work come to fruition. I saw beauty in the struggle. It definitely was not love at first sight, but I guess you can say it grew on me. Playing in Canada last summer at the Pan Am Games with my name on the back of a Team Canada jersey was a very proud moment. I was definitely nervous though…nervous because my family has been able to watch me play my entire life and I felt they expected me to perform and produce like I did in university and other settings. My family has never pressured me; I created this illusion myself. Also, being in denial that I was nervous and scared added more weight to my shoulders. 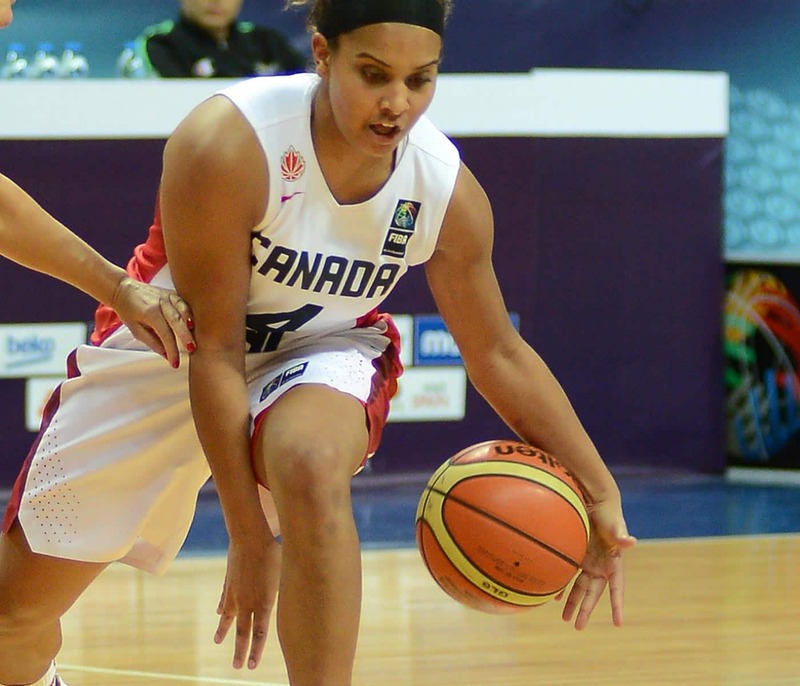 That experience taught me how to handle pressure and nervousness better and it allowed me to be ready for the FIBA Americas. Winning the gold medal was not the most memorable moment of the tournament; it was the interaction with the people that left the deepest impression. It was how all the kids would swarm around us asking for our autographs. I was famous for 60 seconds, but it was more than that. It was being able to show the young girls that women can excel in sports, we can have a career, we can follow our dreams and aspire to big goals. As I spoke with the fans I could see the excitement in their body language and the astonishment in their eyes. Walking into the Saville Centre in Edmonton and feeling the patriotism bouncing from one fan to the next was electrifying. The entire gym sang the national anthem so loud and proud that it was impossible to hear the music. The fans admiring and believing in your goals are the things that I cherish the most. Those are the memories I will always carry with me. Those are the memories that motivate me to be the best version of myself. It seems surreal to think that I, a girl who grew up in Windsor, was able to bring these feelings out of people by simply playing a game that I love. I am a perfectionist, I want to do things right and I want to perform my best at all times… and not performing or living up to my potential is definitely a fear heading to the Rio Olympics. Another fear is not living in the moment. Of course I want to focus on getting a medal in the Olympics, but I don’t want to overlook the entire experience of being there. I want to meet world-class athletes from around the world, learn about them, their training and their respective cultures. I want to enjoy myself and have fun so I can come home and share my stories with my friends and family, and in the future, my own children.